If we are troubleshooting a system, it is important for us to have all the necessary tools and software with us which can help us fix problems. One of the problems that we may encounter is an unbootable PC. In this scenario, none of the tools will work as the PC can’t boot into any Operating System. In this situation, a bootable rescue disc comes handy. If you don’t have a good antivirus installed on your system, virus will corrupt your system to the extent that it won’t boot. In this case, you can easily use one of the Rescue ISO files to disinfect the system and make it bootable again. In this article, we will discuss about the security rescue discs provided by the Antivirus companies. These bootable rescue discs will be able to clean your system from viruses even if your system can’t start. Bitdefender provides a very simple Rescue ISO image which we can either burn on a CD-ROM or a USB drive, boot from it and scan any system for viruses. The Rescue CD can also update itself automatically but it will require an Internet connection for updating. Kaspersky Rescue Disk comes with a file manager, a registry editor and a web browser which you can run while starting your system with Kaspersky Rescue Disk. This gives a power user additional advantage of troubleshooting an unbootable system apart from scanning for viruses. AVG Rescue CD is a text based bootable solution to corrupted systems due to viruses. It will even scan inside your archives to remove any threats from an unbootable system. Avast lets you create a Rescue CD or USB from its own installation. You can’t download it separately. To make a rescue CD, you will need to install Avast antivirus and then create the bootable media of your choice. To create Avast Rescue Disk, go to Tools –> Rescue Disk and follow the instructions to complete making your bootable rescue CD or USB. Avira Rescue System scans for malware on a system that is unbootable or generally become unresponsive. It can boot into the system and find viruses and other malware. VIPRE Rescue is designed to disinfect and clean the systems which have no antivirus installed and the virus has made it bootable. Panda Cloud Cleaner, in addition to cleaning unbootable systems, can also scan and disinfect VMWare images. If the actions of malicious programs made it impossible to boot a computer running Windows, recover the affected system for free using Dr.Web LiveDisk! Sophos has a not so friendly download and installation procedure of its bootable antivirus. You will need additional steps like signing up for a Sophos account in order to get the bootable image. Trend Micro Rescue Disk allows you to use a CD, DVD, or USB drive to examine your computer without launching Microsoft Windows. It can scan hidden files, system drivers, and the Master Boot Record (MBR) of your computer’s hard drive without disturbing the operating system. Windows Defender Offline is Microsoft’s own troubleshooting tool which will scan for viruses in a non-bootable Windows installation. 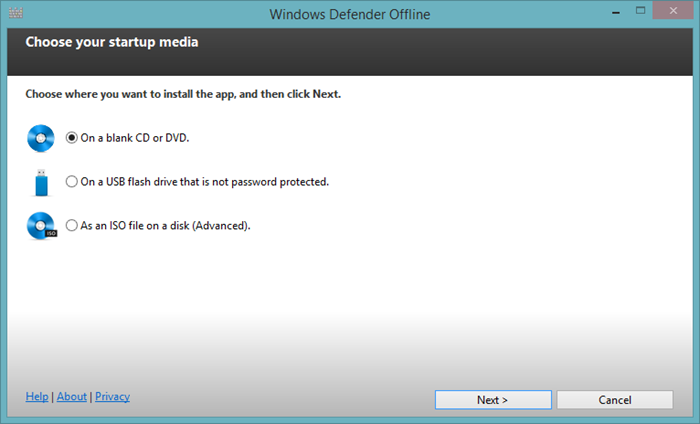 There are two different versions of Windows Defender Offline for 32-bit and 64-bit systems. Download the appropriate tool from the below link, run the utility, follow the four steps and create a bootable CD/USB of Windows defender Offline. You can transfer all of your important documents on USB-carriers. You can scan your computer for viruses and if necessary to clean the infected files. Starting the scanning is also possible in safe Windows mode. Thus, this software can be used as additional antivirus protection to already installed antivirus on your PC. clone computers over the network via multicast. self update capability to include and update all virusscanners + local changes you made to TRK. Note: Trinity Rescue Kit has not been updated since 2011 so I would not recommend using it at least for virus scanning. Comodo Rescue is a free bootable antivirus program which can clean your system from viruses, rootkits and other malware. It supports heuristics scanning, options to skip large files for quick scanning and can scan archives. eScan Rescue Disk provides you with a Windows based clean environment that not only helps you to scan and clean the system but also to fix the Windows registry changes done by viruses. The G DATA boot medium is a practical aid for detecting viruses that have already embedded themselves on your computer prior to installing the antivirus software. Norton Bootable Recovery Tool is Symantec’s tool for disinfecting systems that are not bootable due to viruses. PC Tools Alternate Operating System Scanner is not only a bootable antivirus, it can act as a data destroyer, data recovery tool, a system shell and a file manager. Quick Heal Emergency Disk provides its users with a Windows environment to troubleshoot the system and scan for viruses. You can download the appropriate zip file and follow the instructions to create the Live CD. Almost all the above mentioned downloads are ISO image which either need to be burned on a CD/DVD or on a USB drive. You will need a third party app in order to burn the ISO image to the CD-ROM. Here are the step by step information for doing this easily. There are quite a few tools that can create bootable USB drives from ISO images. I will use Stickifier here as it is free and open source. Just follow the steps below to create a bootable USB drive with one of the above mentioned antivirus ISO files. Insert the USB drive into any USB port. Open Stickifier. It will give you two options: Either you can download the ISO directly from the Internet or you can browse to the ISO file you want to burn into the USB drive. Click Next and select the USB drive letter. Clicking on next starts the installation process. I hope now you will be able to select from one of the Live CDs and troubleshoot your system. If I have missed anything, please let me know and I’ll fix it as soon as possible. The information is incomplete. Bitdefender does not work in every computer and it lacks crucial information about its correct usage. It does ask for a username and password at startup and nobody knows it. I guess it works for those who own a paid copy of the antivirus. Typing “livecd” for a username it will attempt to run and it will probably fail with a “server error” message. Avast takes a lifetime to build a rescue disk and if a user stops the process it will never start again. It will show up an error message while attempting to create a rescue disk. There is no AV in the market that can find a malware that keeps on calling a “gocloudy” web site or “maxonclick”. An unknown type of virus keeps on changing the signature of every antivirus files. Try first to run Hitman Pro and verify if any virus is changing the signatures or your files. I am confused that whether the mentioned process can be applied in my notebook (Asus X54C) where the problem arises after completion of a part of whole installation . at the point of typing PC name the keyboard suddenly becomes irresponsive. I tried win 7(32&64), win 8, but same thing is happening. Please help and reply to my mail. Personally, I have had nothing but BAD LUCK trying to use USB drives on virus or malware infected systems! My computer had a virus on it, which I believe might have been TDL4 or a variant of it. Anyway, I tried different AV programs from my USB drives, and every USB drive I plugged in got infected instantly! The reason is that nothing could keep the virus from restructuring the USB drives in the first few milliseconds after being plugged in! So, the ONLY USB drives I would EVER trust for such a task would be the type that have a HARDWARE SWITCH that makes the drive “read only” so that NOTHING could possibly WRITE to that drive, no mattter what kind of virus, malware, or worm it was, including Stuxnet! Either create a bootable CD, which is read only, OR use an uninfected computer to make your bootable USB. Exactly, you won’t create your USB from an infected computer. Kind of obvious, but it’s always good to explicitly point that out. It’s wonderful .. thanks a lot.